The classic KeaRider motorcycle tour through Florida: Experience the Sunshine State during a 10 day motorbike tour. 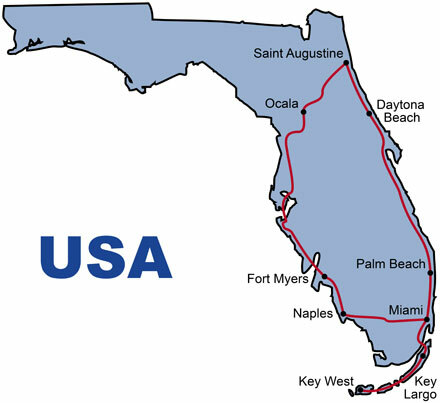 The round trip starts in Miami and heads over to the most beautiful beaches on the Gulf of Mexico up north to Saint Augustine the oldest European settlement in the region. From here you head back south to Miami along straight highways on the fabulous Atlantic Coast. During this motorcycle tour across Florida you will visit natural wonders such as the Everglades National Park and meet dancing mermaids and wild pirates in exciting entertainment shows. Other highlights on this road trip are a visit to the Kennedy Space Center in Cape Canaveral and the legendary Harley-Davidson shop of Bruce Rossmeyer in the motorsport paradise Daytona Beach. After an individual journey, tour participants meet in Miami and head for the Everglades National Park, where you can take part in an airboat ride through the wetlands. Accommodation is in Naples. Cruise along the beautiful seaside resorts on the Gulf of Mexico to Fort Myers, where among others a tour of Edison home and Museum is on the agenda. Your motorcycle tour continues north to the famous Mermaid shows of Weeki Wachee and on to Ocala, Florida. You will visit one of the famous racehorse studs of Ocala and then drive to Saint Augustine, the oldest European settlement in Florida, where you can visit a pirate show at night. Today, the motorcycle tour continues on to Daytona Beach, where the world's largest motorcycle dealer Bruce Rossmeyer's Harley-Davidson steps up the heartbeat of every biker. Accommodation is near the beach of Daytona Beach. After a detour to the Kennedy Space Center, you will cruise back south to Palm Beach and check into your hotel. Well rested the ride goes on to Fort Lauderdale, where you have the opportunity to shop before you continue on to Miami. In the morning, you will first visit the most beautiful sights of Miami i.e. the Art Deco district, before you head for the Keys. Accommodation is in Key Largo. A highlight for every motorcyclist awaits you today: The trip across the many bridges through the island group of the Keys down to Key West, the southernmost town of the United States, where you will spend the night. The last day begins with a visit to the Dolphin Research Center on Grassy Key before you return to Miami and start your individual journey back home.